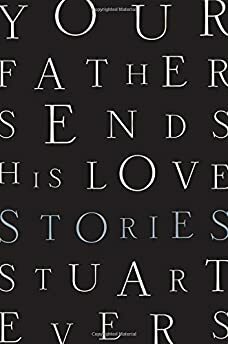 Largehearted Boy: Book Notes - Stuart Evers "Your Father Sends His Love"
Book Notes - Stuart Evers "Your Father Sends His Love"
Poignant and acutely told stories of love and family make up Stuart Evers' new collection Your Father Sends His Love. "Wit is a precision weapon, and Stuart Evers is astonishingly precise. It takes an enormous and well-calibrated brain to put together a collection like Your Father Sends His Love. It is one of the funniest―savagely funny, tenderly funny―and therefore one of the most moving books I’ve read in a long time"
The writing of Your Father Sends His Love coincided with a sustained period of musical rediscovery. I had a new job which required no commuting time, which meant I was able to spend some time with my son before taking him to the childminder. Each morning, we'd listen to a few songs by a single artist and I'd note down his favourites. He loved Dusty Springfield, Prince and Led Zeppelin, but hated Elvises Presley and Costello; would not tolerate any kind of jazz, but couldn't get enough Dolly Parton or Johnny Cash. It made me, after a hiatus of many years, think about music again: its power, its ubiquity and how it had been so important to me once, but had been relegated to radio and the occasional gig. Unlike my previous books, music is less obvious in these stories, perhaps reflecting the age and temperaments of the characters, but its influence remains, though perhaps plugged deeper into the metadata of the writing. In 'Smalltown Boy', the hypnotic falsetto of Jimmy Somerville, allied with its mournful electronic backdrop, creates a resonant, almost derelict atmosphere of dread and fear. The refrain – turn away, run away, turn away, run away, turn away – stuck in my head as an eight-year-old and became an underlying mantra for decades. 'Lakelands', the first story in Your Father Send His Love, but the last to be written, was subconsciously informed by the explicitness of that song – its video was the first time I'd ever seen an unashamedly gay life depicted on screen – and how progress hinges not only people but also on the environment and times in which they live. My ex-girlfriend's father once said in his optimistic, infectious way, as we were listening to the opening track of Paul Simon's Graceland: 'These really are the days of miracle and wonder, aren't they?' I agreed, even though a more cynical reading would suggest Simon's lyric was heavily soused with irony. This uneasy co-existence of hope and cynicism, and the sense that thoughts, actions, and ideas stripped of context can be the opposite of what we think they mean, came to inform the story of a grandfather kindling a relationship with his adult grand-daughter. Paul Simon is one of the great under-rated songwriters, and this one of his finest lyrics. If Your Father Sends His Love has a spirit animal record, it's Graceland. The band I listened to most at the time of writing the collection, The Drink occupy a difficult to describe musical space: part lo-fi, part disco; part folk, part funk; part dreamlike terror, part wide-eyed innocence. 'Frequencies' has a similar colliding of styles and emotions, a similar approaching sense of menace. Their most recent record, Capital, is the only LP I know that fuses disco with doom rock. 'Wings' is the story of a mother caught in the slipstream between the past and the present, the person she once was and who she is now. The vector of this is her dead sister, who semi-haunts her life. As I was writing, I suddenly exactly knew exactly who her sister was. As a young teenager I'd been waiting for a bus outside school. I was singing 'Theme from S-Express' to myself, quite quietly, and this fierce fifth-year girl – the most attractive girl I had ever seen – pointed at me, pushed me and said. 'That's my song. Shut up.' That was Gwen right there. It's also one of those records I can't resist dancing to. The first draft of 'Something Else to Say' was written in a bar, using only the people around me as props and guides. As with many such exercises, very little of that draft survived into the finished story, but the stereo playing 'Sunshine of Your Love', at a random moment, fitted perfectly and made it through to the published version. In the book, the two main characters listen to the Cream original, but the Ella Fitzgerald cover – that voice! Those horns! That sleazy piano! – is so much better I can't bring myself to suggest anything else. If you write that music's playing in a story, it's fine not to mention what it is to the reader, but as a writer you should probably always know what your characters are listening to. In the opening scene of Sundowners, Ross leaves the bedroom, annoyed by the evasions of his married lover. She hears the muffled beats of music playing. It is without a doubt, Fresh Garbage by Spirit, a record just – but only just – the right side of self-indulgent psychedelia. I listened to Miles Davis every working day for three months, mainly the howling fusion seventies stuff, and this first track from the Tribute to Jack Johnson record was the one to which I kept coming back. It had an effect on the writing of the title story, Your Father Sends His Love, in a very tangential way. It perhaps encouraged a greater sense of ambition, a wider accumulation of style and interests. My son's favourite song for months, this is country soul at its most idiosyncratic and foot-tapping. The whole theme of what a parent can provide for a child – at its best, at its worst, at its most genetic – is similarly at the heart of 'Charter Year 1972', the shortest of all the stories in the collection. 'Swarm' is set in a near future where others' experiences can be linked and felt through a kind of virtual reality device. In one scene, the central character experiences the death of another and, as in a movie, the credits begin to roll backed by specially composed music. In my head, it was always this track by Max Richter, unbearable, unbeatably moving. When I first moved to London, I lived in above a Turkish bakery in a predominately Turkish area. During the long hot summer of 1999, I spent hours looking down onto the street below, watching people going about their business, the smell of cakes and pastries wafting up long into the night. There was always music, Turkish traditional or pop music, and every shop seemed to have a collection of tapes for sale. I was reminded of that time while watching Çigdem Aslan at the WOMAD festival, and the slightly odd story of two Russian men I'd been writing, 'What's Going On Outside?' coalesced against that backdrop. Don, the central character of 'This is Not a Test' runs the finest pub quiz in the Cyprus resort where he lives. The last answer in the quiz is always 'Sweet Caroline' and everyone sings along at the end of the night. I've never seen such a thing happen, but it sounds like fun – and 'Sweet Caroline' is probably the best ever song to sing in a drunken, sunswept place. Don is also an Elvis fan, so I went for the Elvis version, rather than the (superior) Neil Diamond original. The final story in the collection, 'Live from the Palladium', is notionally about comedy, something that has fascinated me since I was a child. 'Hello Muddah, Hello Faddah' is one of the very first songs I remember hearing, and I still remember the visual images it provoked. As a child, the music that left an impression on me – Hard Day's Night, Hit the Road Jack, Messin' About on the River, A Dime and a Dollar – came with a very specific imaginative accompaniment. As a comedy song, this is pretty hard to beat.